So I'm using your partition software trying to migrate windows 7 to my new SSD. I follow the steps, too easy, but then get to the point where it says to check the box to delete all partitions and it says that I haven't allocated enough space and i need at least 706 GB. All the tutorial videos I've watched have people migrating windows 7 to even smaller drives. Windows is less than 60 GB in size so why am I getting this error and how do I fix it? All I want to do is migrate my OS and only my OS and slave my HDD I am not trying to clone my entire drive. Please and thank you. Your OS is on F ? Almost 700 GB is in use. You have to clone the whole F partition and the system partition, I guess the software cannot extract only the OS part from the partition and expect it to work. You better reinstall windows 7 on the SSD using installation DVD or use a bigger (1TB) SSD. no f: is a third drive, C: is my boot drive and it has roughly 600 GB of 1.8 TB space used. but if i understand you correctly i have to ether format the disc then try and migrate windows or just boot from a cd or usb and just install windows directly? i cant just pull only the operating system from my primary HDD and move it over to my SSD without pulling all the other files and programs with it? No. You cannot migrate a portion of a partition. If C is the partition where your OS is located, you have to clone, migrate or backup the whole partition. Therefore the destination must be large enough to accommodate all the data on it. JohnnyboyGo was trying to give you a way to reduce it's size. Migrating the OS will also copy the System reserved partition. Your screen shot blocks the information as to where your boot info and active partition are. 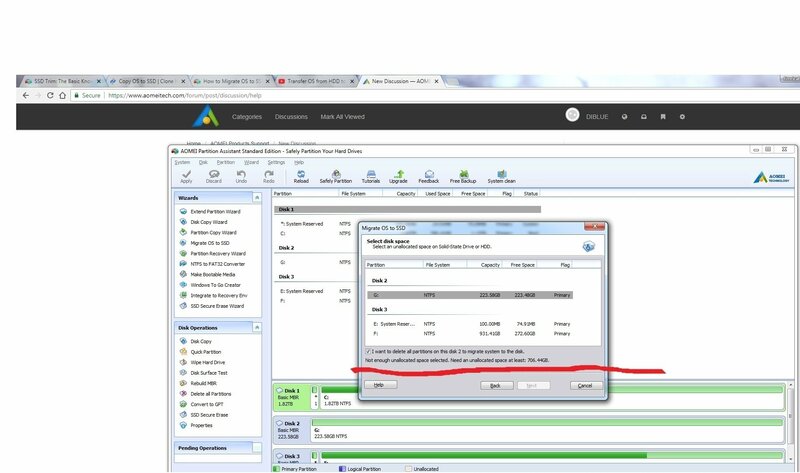 See if you can provide a screen shot from disk management of your C drive. It may provide more information. Are you using a dual boot system? It looks like your F drive is also an OS drive?????? ?